This is an excellent, interactive resource for teaching about Martin Luther King's "I Have a Dream" speech and the March on Washington! 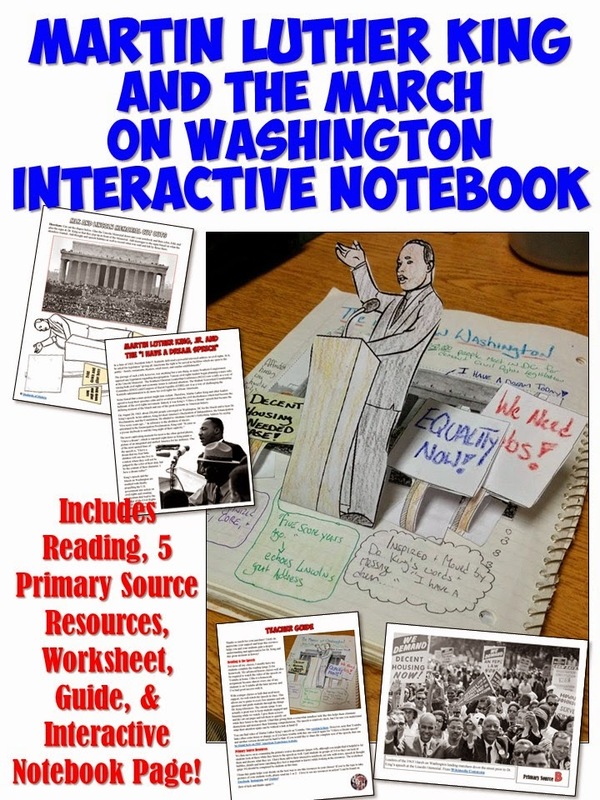 It includes a reading, primary sources, worksheet, and pop-up style Interactive Notebook page! The 1-page reading includes an introduction describing the background leading up to the March on Washington and impact that it had. Links to the speech are includes as well for you to use with your students. Five primary source images and documents are provided for students to analyze. The worksheet features questions designed to get your students to think critically about the event, speech, and primary sources. A key for this is included for your convenience. Finally, the Interactive Notebook page has students creating a pop-up of Martin Luther King along with several signs and the Lincoln Memorial. Students then decorate these and add notes based on what they read, hear, and see in the primary sources. Completed sample versions are also included for you to look at with the download. All of these are explained in a simple teacher's guide which is included as well! This resource can also be download along with many more as part of this Civil Rights Movement Resource Bundle. You can download this resource for your classes by clicking here! This excellent Civil Rights Movement resource features an information text style reading on the historic 1965 Selma to Montgomery March for voting rights. Also included is a reading comprehension worksheet and Interactive Notebook page for your students to use based on the reading! The 1-page reading describes the purpose and leaders of the Selma March as well as the infamous events on Edmund Pettus Bridge. It concludes with the effect the March had on getting the Voting Rights Act of 1965 passed. The worksheet features questions designed to get your students to think critically about the March and gauge their reading comprehension skills. A key for this is included for your convenience. Finally, the Interactive Notebook page has students create their own vision of what happened on Pettus Bridge and describe the groups involved. This is a great activity for students to work on based on what they read! Completed sample versions are also included for you to look at with the download. 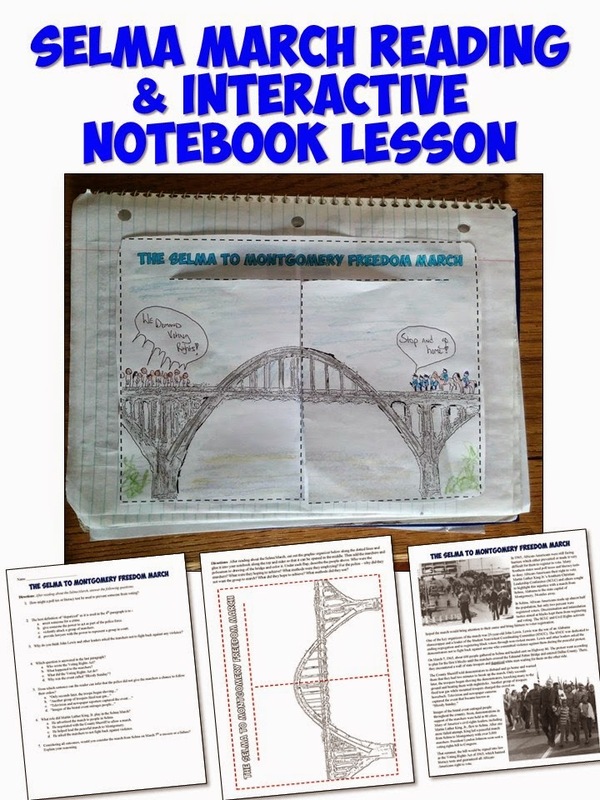 You can download this great resource on the Selma March by clicking here! This fantastic Industrial Revolution lesson bundle includes 22 amazing resources to teach an engaging, student-centered unit on the Industrial Revolution! It includes 4 PowerPoints along with multiple worksheets, Common Core-aligned readings, games and projects that work well for almost any group of students. The resources cover urbanization, inventors and inventions, working conditions, Robber Barons, Communism, and more! 1. The best-selling Industrial Revolution Child Labor Story with Questions. 3. The Effects of the Industrial Revolution & Communism Lesson Plan - which includes a very engaging PowerPoint, graphic organizer for notes, and worksheet. 4. A fantastic worksheet on the major Inventions of the Industrial Revolution. 5. A brief Andrew Carnegie Biography Worksheet that includes a reading and questions. 8. A fun, active Determining Your Horsepower Lesson for the Industrial Revolution lesson to get students up and moving while they learn. 9. The engaging Upton Sinclair's The Jungle Reading, Worksheet, and Interactive Notebook Page to have students interact with an excellent primary source. Think of all the time you'll save with 2 whole weeks planned out in full! An easy to follow directions page explains how to implement each resource!